She opens up through the energy of the moon. She feels more emotional and receptive and ready after releasing and shedding. She’s letting go so she can heal old patterns and limiting beliefs that hold her back. She wants to align with her power. She creates rituals to connect with other goddess to share, to laugh, to cry and be seen. She drinks the powerful Cacao medicine and feels the euphoric feelings that dissolve her stress and anxiety in an instant. Her heart feels radiant and open. She feels empowered and ready for action! 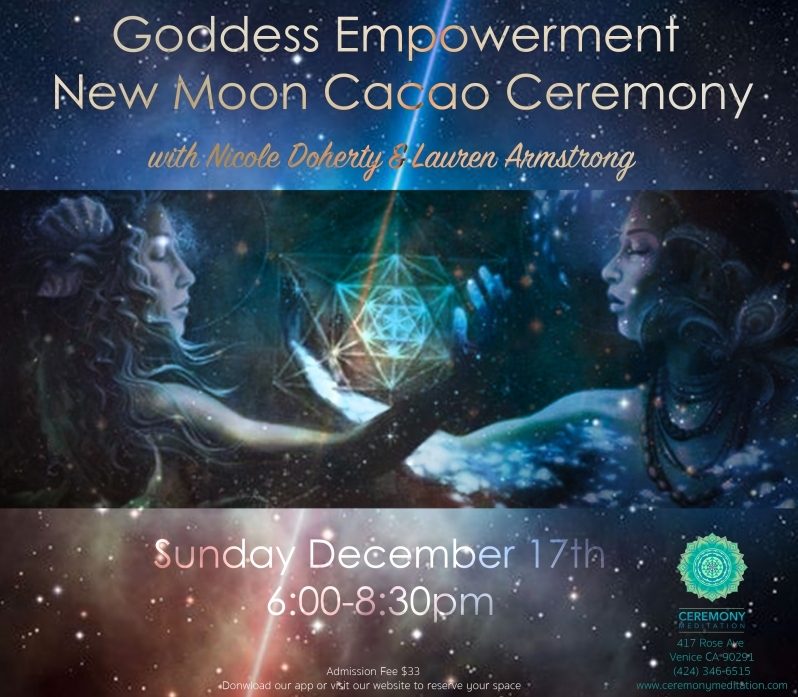 On Sunday, December 17th, under the new moon, we will experience the powerful healing properties of raw, organic, blessed ceremonial Cacao. Once we activate ourselves with this magical heart-opening medicine, we will be led through a powerful ceremony which will include tantric connection practices, intention setting, Shamanic breathwork, ritual, meditation, chanting and Shamanic medicine music for a closing sound bath. Contraindications: Be aware that raw cacao acts as a stimulant, which at the least can negatively affect sleep and at worst may agitate kidneys for those with any conditions of these nature. If you are pregnant or nursing, please check with your physician first. Lauren Armstrong is an E-RYT 200 Yoga Challenger, Light Coach, Shamanic Reiki Healer, Singer, Comedienne and Writer. While studying for her Master of Fine Arts in Acting she discovered yoga and breathwork, which inspired her to dig deeper into her own spiritual existence. She moved to Los Angeles and was immediately enamored of the health-conscious, light-hearted, yet deeply spiritual community residing here. She wrote and starred in a podcast about the joys of making healthy, wholesome food taste delicious called The Foodiegasm Podcast She went on to study Power Vinyasa Yoga at Earth’s Power Yoga with Steven Earth Metz, and has been teaching yoga ever since. Lauren studied Reiki and Shamanic healing practices with shamans trained in the Shipibo tradition in Peru, learning how to guide others through trauma and stuck energy to bring about deep healing. She has led workshops such as The Sacred Art of Play, Improvisation for Presence, Goddess Full Moon Gatherings, Storytelling Circles and Shamanic Breathwork Ceremonies. She believes that the Power of Love and the Oneness of All can be easily brought to light through song, story and laughter. Nicole Doherty is the founder of EMPOWERTOEVOLVE, an Evolutionary Empowerment Healing Arts Academy for Women to Thrive. As a Shamanic Empowerment Coach, Shamanic Reiki Master Healer, Ceremonialist and Medicine Woman, she helps women to awaken their inner shaman and unleash their priestess power! Through her authentic vulnerability, powerful voice, strong intuition, and lightness of being, Nicole co-leads women through a deep alchemical healing process with Spirit and empowers them to activate their highest potential. Nicole’s initiation into Shamanism began in Peru in 2011 at the Temple of the Way of Light in the Shipibo tradition of the Peruvian Amazon and has been co-facilitating circles with her teacher and the master plants since. She studies the Pachakuti Mesa tradition founded by Master Peruvian Curandero, Don Oscar Miro Quesada and Alan Waugh. Nicole has dieted master healing plants in Peru with Maestros Don Benigno & Don Guido. You can find Nicole teaching trainings and classes in Los Angeles, CA as an E-RYT 500 YogaWorks Teacher & Trainer. She also offers Goddess Full & New Moon Gatherings, Cacao Ceremonies, Shamanic Reiki Circles and Women’s Empowerment Workshops at large festivals like Lightning in a Bottle, Symbiosis, and Oregon Eclipse and leads transformational healing retreats around the world. Nicole writes for a variety of wellness blogs, such as MindBodyGreen, Elephant Journal, Yoganonymous, Yogaworks, Beach Bodies, and American Athlete.